My father took up running again in 1977, aged 64. In 1981, aged 68, he ran the Aberdeen Marathon in an impressive 3.31.16. 1980 events included managing 18 miles in a Hazlehead Park sponsored walk in April; and completing the 4th Annual Scolty Hill Race in Banchory. I also remember him really enjoying the Aberdeen AAC club half marathons (From and to the Bridge of Dee: out the North Deeside Road, turn left at Milltimber Brae and again at the Mill Inn, then in the South Deeside Road.) Dad said it was his favourite distance because, unlike after full marathons, he could then enjoy wolfing down a big meal! On the 24rd of August, he took part in the World Friendship Jog before running the marathon in the 13th Annual World Veteran Championship Marathon, around Bellahouston Park in Glasgow. I was a jogging supporter that day, and can assert that Dad’s 3 hours 45minutes 21 seconds (for 3rd M65) was slowed somewhat by his prostate – no less than six comfort breaks! His age-group team gold (with other M65s, the great Gordon Porteous and Bert Grant) was Scotland’s only one. The World Veterans team gold medal and (silver individual one for third place) are delightful thistle-shaped designs by Carrick Jewellery Ltd. Unlike many of the marathon men of the 70’s and 80’s, however, James had a running career before that one. The two are as distinct as chalk and cheese. 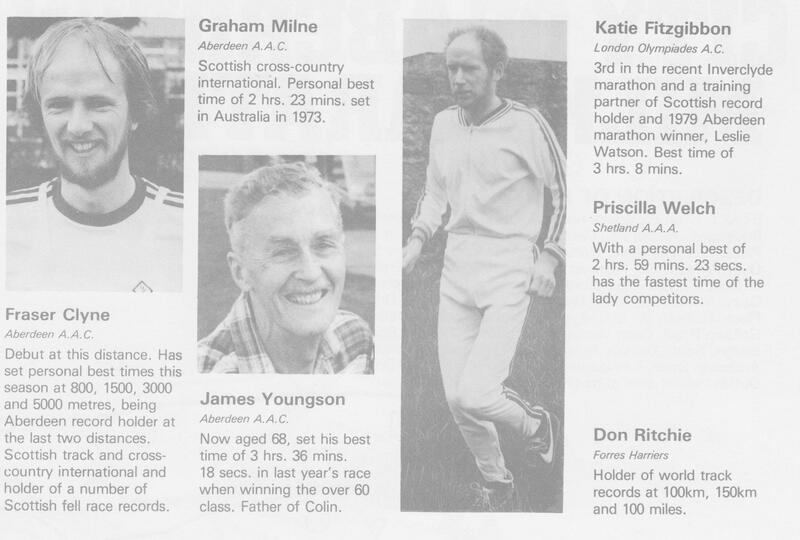 From the Aberdeen Marathon Programme in 1981. BUT WHAT ABOUT HIS EARLY RUNNING CAREER? Of course ‘young Dad’ must also have been ‘cross-training’ like crazy, as well as running, and race-walking to and from Burtons, via Jack’s Brae: sea swimming on the first of January or in the salt water Beach Baths or even in Egyptian brine; cycling up to Ballater after work on Saturdays, staying at a Youth Hostel, and then taking his racing bike through the Lairig Ghru; sleeping in mountain bothies and ditches; speedy hill-walking away from Jimmy Chivas; playing football, badminton and basketball and striding out briskly in the Egyptian desert while towing dogs called Joe, Bess or Ena; and (mainly after the war, I believe) taking part in time-trial fixed-gear bike races on the South Deeside Road. The club rented a wooden hut on the south bank of the River Dee, upstream from the Victoria Bridge. This hut belonged to a swimming club. Lighting was by paraffin lamp, and water had to be carried in from the outside and heated over a stove lit by the athletes. A zinc bath was used for sponging after training runs. Track training was carried out on a cinder running track in Linksfield Road. When they all went out for a cross-country or road training run, a ‘Pace-maker’ and a ‘Whip’ were appointed, to make sure that the pack stayed together, until near the end when they were free to race home. (Even when I ran for Victoria Park AAC in Glasgow in the early 1970s, a similar system operated, with a slow pack going off first, and then the fast pack to chase them round a certain traditional road route.) Then in August 1939 the YM Harriers agreed that the club should go into abeyance until the war situation became clear. War was declared on 1st September; and the club was never formally reconstituted. However some of its trophies are still competed for by Aberdeen AAC. On the quest to find out about Dad the young athlete, I went to Aberdeen Public Library and looked up microfilm of old editions of ‘The Press & Journal’ and ‘The Evening Express’. He left Gordon’s College at the age of 15, probably in 1928, but retained his link with the school as a Gordonian. His Blues Scarf has the dates 1933-34. Was this for summer track athletics or winter road and cross-country? On Saturday 17th June 1933, the Evening Express has a brief mention of an athletics contest between Aberdeen University and Gordonians at King’s College grass track (where I also raced many times in the 1960s and 1970s). The Students won, but five Gordonians, including ‘J.A.Youngson’ are reported to have done well! The reporter was ‘confident that, with a bit more training, Gordonians will give their rivals a better tussle’. Dad may also have competed for Gordonians at King’s in a five-team athletics match on 5th August 1933. ‘Varsity’ won; with Shire Harriers second; Gordonians third; in front of Dundee Hawkhill Harriers (!) and Aberdeen YMCA. By the way, until the 1970s it was traditional to refer to athletes by their initials in sports reports. Hence J.A. Youngson. I remember Mum saying that some of Dad’s pre-war friends used to call him JAY rather than James or Jim! So how about the 1933-34 Winter Season? Well although Gordonians had a pretty good athletics team, it seems that they could not field a squad to take part in cross-country events. This would explain why there is no mention of Dad taking part in the NEHA fixtures that season. It also explains why he later changed clubs, joining Aberdeen YMCA Harriers in early Winter 1934. On December 14th 1933, the EE published a timewarp photo of three ‘Trail-layers’, each with a satchel under his left arm, dropping a trail of shredded paper for a NEHA cross-country course. I knew of this system, but it had stopped by the mid-sixties, when I first ran cross-country. Did all the runners get lost if it was windy? However Dad definitely ran well for Gordonians in Summer 1934. I remember that he said he used to train sparingly, since athletes at the time were afraid of becoming ‘stale’. A 1933 EE article on diet emphasises that ‘over-feeding and rushing of meals will bring on staleness quicker than anything else’. Oatmeal porridge is recommended, as well as fish, milk, eggs, roly-poly pudding. Vegetables are deemed necessary at dinner, but only a few potatoes. In the morning, the kidneys will be cleared if one drinks a glass of water. Cakes and sweetmeats are regarded with suspicion. An occasional dose of treacle is considered a good laxative. Simple foods and not overloading the stomach should pave the way for future success! On the Wednesday the 4th of July 1934, the EE reports that there was an athletic meeting at Seafield (Gordon’s College’s old sports grounds, where in 1965 I finished a very long way ahead in the one mile race on a grass track during the local derby Aberdeen Grammar School versus GC match.) Dad however, representing Gordonians, finished half a yard down on Alex Milne of the YMCA, who won in 4 minutes 50 and four-fifth seconds, with George Milne third. Maybe they talked Dad into changing clubs that autumn! Dad is also named in the winning medley relay team (probably running 880 yards) when Gordonians beat Aberdeen YMCA Harriers. This was also the overall result in the match. Very probably it was Dad’s form this summer which won him his Gordonian Blue, and enabled him to buy his scarf and the blazer which he wore so proudly. On Friday 27th July 1934 there was a match at Hazlehead: AU Hares and Hounds vs YMCA vs Gordonians. On this occasion, Dad finished third in the two miles race, behind one Varsity runner and one Shire man. There was a team race, so he certainly would not have been last! The winning time was 10 minutes 19 seconds. Gordonians had one extremely good sprinter and some field athletes, but Dad seems to have been their best distance man. Incongruously, right next to the P&J athletics report is a very large advert for cigarettes with the slogan ‘Have a Capstan!’. On the 4th of August 1934, adjacent to a list of results from the Empire Games is an equally detailed list of results from the Pittodrie Sports! Dad finished third in the one mile behind a couple of successful local runners: C. McPherson and A. Watt (both Shire). It must have been a thrill to race against the best local men (and some from Dundee) in front of a crowd of 5000 on the Dons’ hallowed ground. It was announced in the EE in late October 1934 that “The Aberdeen Y.M.C.A. Harriers have now everything in apple pie order for the coming season. Although the active membership is 21, there are still a few vacancies for lads who wish to take up the harrier game.” Who could resist the call? Not Dad! Then, Eureka! A report of the race in which Dad won his NEHA medal! The P & J on Monday 19th November, 1934, described a race which happened on Saturday 17th. Below is a summary. In the North Eastern Harriers Junior 3 miles 6-man team championship, held at the Links, Aberdeen Y.M.C.A. Harriers achieved individual and team victories.” There follows an account of the first two miles, led by various nonentities. Then! “In the last mile, the favourite, James A.Youngson, went to the front but could not shake off the Milne twins, who were running in a loose and easy style. These three club-mates had a desperate fight, until the final sprint. Alex Milne won by inches from James A. Youngson, with George Milne a yard behind. The EE on the following Saturday 24th November 1934 comments further, in a weekly column by “Roadside” who deals with cycling, running, race walking and track athletics. Last Saturday’s three-mile junior team race at the Links resulted in another YMCA triumph. Alex Milne, James A. Youngson, and George Milne filled the first three places and the club also won the team event by a comfortable margin. The ‘Y.M.’ also had the first three men in the two-mile novice championships at Pittodrie Park in October. This would seem to indicate that they have, at present, the best set of youngsters in the city. Next step was to try to find an account of the novice two-mile race, round the cinder track the outside of the football pitch before the Dons home match versus St Mirren on October 13th, 1934. If Dad had ended up favourite for the three-mile event, surely he must have won the earlier race? But no, he didn’t even run, although the Milne twins did, so Dad must have won a novice race previously, just possibly while representing Gordonians during 1933-34, and subsequently had been upgraded to ‘junior’ athlete status. A ‘novice’ before the war was someone who had never won a race in open competition. On Saturday 24th November 1934, there was a 20-mile relay race from Invercannie Waterworks near Banchory (starting on the 20th milestone on the N. Deeside Road) to Aberdeen. Although the Milne twins ran for the YM Harriers, who finished second, Dad was not named in their team that year. In December 1934, Dad was mentioned in the EE as liable to figure prominently in the forthcoming YMCA Harriers 5 mile club championship over the Torry course. This was “likely to result in a duel between James Youngson, James Thow and the twin brothers – Alex and George Milne”. The route was from the foot of Menzies Road, past Craiginches to the top of Nigg Brae, where the runners took the turning that led to Bridge of Dee, before crossing the bridge and racing down Riverside Road, to finish near Victoria Bridge. However Dad did not take part. Arthur Lobban won, followed by Alex and George. In Dad’s 1981 interview he said that he had some success before the war in local one mile and two mile events. In addition, he definitely ran well over three miles; but perhaps five miles was too far, considering how little he trained. Maybe, by contrast, the Milnes gained superior stamina because they banged in the miles by training together all the time – tantamount to cheating! There is no mention of Dad in early 1935, until the last race of the season, on Saturday 16th February 1935. The EE article states the following. The fifth annual three-mile race for the Caledonian Cup will be held under the auspices of the North Eastern Harriers Association, today at 3 p.m. The competition is open to all amateur clubs within the area. Teams are of twelve runners each, of whom the first six men home count for places. Teams are forward from ‘Varsity, Shire, Aberdeen YMCA, Gordon Highlanders (2 teams) and Elgin YMCA Harriers. The course is from South Esplanade West, past Craiginches to Harpers’ Works, striking off to the left to take the fields over to the road leading under the railway. Runners then take the country again to come on to the road at the railway cabin, and thence back to the finishing point in South Esplanade West. Stripping accommodation is at the Dee Swimming Clubhouse, near Victoria Bridge, but ‘Varsity and ‘Shire will strip in the ‘Shire hut at Suspension Bridge. There follows a full list of entrants, oddly not including Lobban and the Milnes. Next Monday’s P&J has the results! “Varsity won the N.E. Harriers’ Association three-mile junior team championship which was decided over a course at Torry on Saturday afternoon. A field of sixty runners took part. From the start, A.R. Hewitt and N.R. McLean (‘Varsity) forced a stiff pace, with J.A. Youngson (YMCA) five yards in the rear. Taking the country, McLean went to the front, with Hewitt and Youngson at his heels. Midway over the country the three leaders were having a tousy duel, the Elgin team being well bunched together for the team award. Coming on to the road again, McLean was clinging to three-yard lead, from Youngson and Hewitt, with H. McDougall (‘Varsity), J. Riddell (Elgin) and W. Grant (‘Shire) ten yards behind. In the last 200 yards Youngson came away with a terrific burst of speed to pass McLean and carry on to win his first individual honour by twenty yards in the good time of 16 minutes 35 and a fifth seconds. Well! Where did that sprinting power come from? Perhaps this was Dad’s greatest-ever victory. Presumably, having won a ‘junior’ race, he would now be classed as a senior athlete! Evidence of Elgin YMCA Harriers Club’s rise to prominence came in their promotion of an amateur athletics meeting on Wednesday 19th June 1935. This was the first meeting held since the inauguration of the club, and took place at Boroughbriggs Park, Elgin (where I raced a North District cross-country league race at the age of 62 in 2010!) In the previous Saturday’s EE, ‘Roadside’ mentioned that “The ‘stars’ to appear in the one and two miles handicap races are W Fraser (AU), L Davidson (‘Shire) and J.A. Youngson (Y.M.C.A. ).” Then the P&J on Thursday 20th reported that the Two miles race (handicap) was won by local runner J. Riddell in 9 mins 41 and three-fifths seconds, from J.A. Youngson (Aberdeen YM) and A. Murray (Elgin). 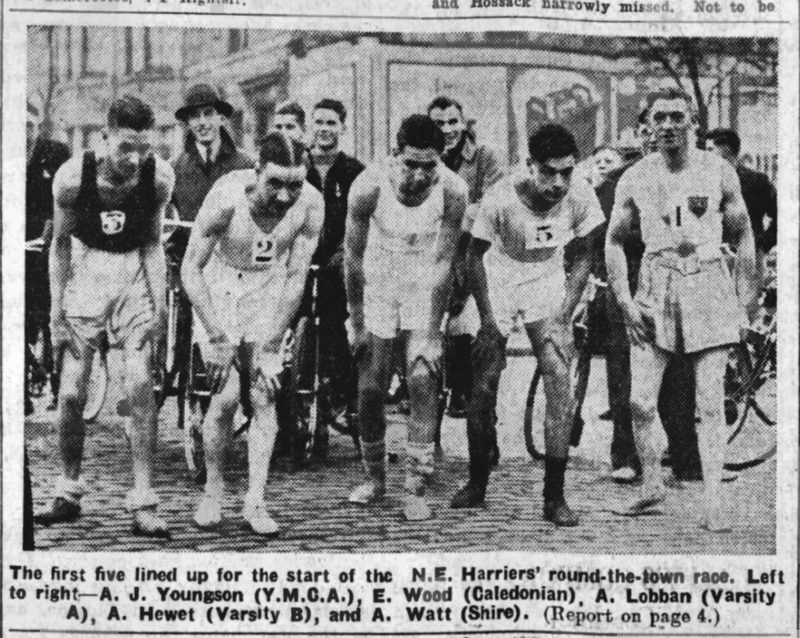 The North-Eastern Harriers’ Association held their 20-mile Round-The-Town Relay race at Aberdeen on Saturday 30th November 1935. Five teams of six-a-side participated in the event, which was won by Aberdeenshire in the excellent time of 1 hour 44 mins 17 secs. Hunter Watson supplied more information. 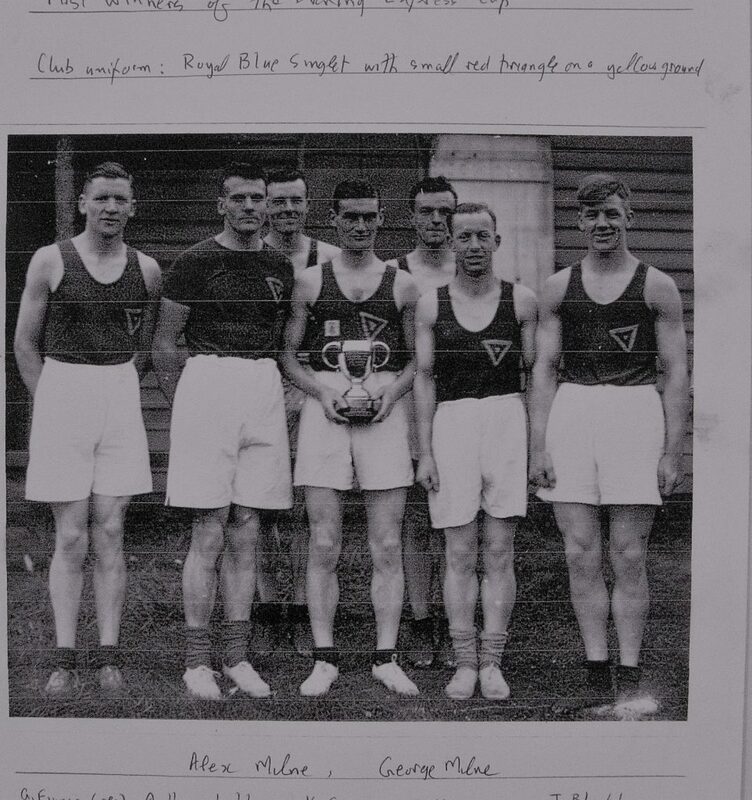 The YM Harriers had not long been formed (possibly in 1933); and Dad would have worn a royal blue vest with a red and yellow triangular badge. The P&J listed all the numbers of all the competitors in the five participating teams; and stated that the Shire Harriers had a winning margin over Dad’s team of only a hundred yards, with the University a further 400 yards behind. In addition there is a blurred picture of the five first lap runners, who were (left to right): “A.J. Youngson (initials wrong way round) (Y.M.C.A. ); E. Wood (Caledonian); A. Lobban (Varsity A; A. Hewet (Varsity B); and A. Watt (Shire)”. Dad is indeed wearing a dark vest with triangular badge and white shorts and white shoes, and looks very young (22), with short dark hair and skinny legs. What a pity the microfilm spoiled the clarity of the photo. The man who outsprinted Dad – ‘G. Lobban’ of the University, does not exist in the programme. This refers to A.W.C. Lobban, who was listed as Varsity B but must have run for the A team. There is also an A. Lobban (Arthur, later the club secretary) in the YMCA team. I assume these were two different athletes (both good runners). Second lap (4 miles) – over Anderson Drive to the Bridge of Dee. Third lap (3 and a half miles) – Over Bridge of Dee and Abbotswell Road to Balnagask Road, out to the terminus at the end of Victoria Road, and in to the end of Menzies Road. Fourth lap (5 miles) – Out Menzies Road to Kirk o’ Nigg, down Abbotswell Road and over Bridge of Dee to Victoria Bridge. Fifth lap (1 and three-quarters miles) – Along the Quay to the end of Market Street and down to the end of Church Street, thence to the Promenade and to ‘the Dance Hall’. Sixth lap (2 and three-quarters miles) – Along the Promenade to the Bridge of Don and in King Street to the end of University Road, where the race finished. And that is the last mention of Dad’s early running I have found. Certainly he did not run longer cross-country fixtures (over five or seven miles) in January and February 1936; and did not defend his Caledonian Cup title, probably because, having won a ‘Junior’ event, he was no longer eligible. Furthermore, there is no mention of J.A.Y. in the summer 1936 Amateur track season. Was that when he was running under a pseudonym in Professional Highland Games like Aboyne, Ballater and Aboyne – when the famous steak knives (which I keep now) were won? If only I had asked what name he ran under! But Dad was a man who took up new hobbies with great enthusiasm; and many of these did not last long. Perhaps he felt he had run as well as he could over one to three miles and did not want to devote more time to training. Perhaps he was sick of being outgunned by the Milne twins, who continued to do well right up to World War Two. Maybe Dad was working long hours and preferred to use his leisure time for cycling or walking. In any case, this ‘restless character’ was in no danger of getting fat or unfit! On the 24th of May: “Felt low all day. Did four laps. Thoroughly enjoyed it.” (I think that says a lot for the therapeutic effect of exercise on Dad’s mood; and that was almost thirty years before he added constant prayer to his regime.) The day after: “Race day but left it alone. One of the boys is supposed to have done the mile in 5 mins. Very good going. I doubt if I could beat 5.30. However enjoyed the training.” (Note the characteristic Youngson lack of confidence before races.) 26th of May: “This is my last day of training. Did a fast half mile with Derek Payne. Felt fine and looking forward to Sports Day. This sort of life suits me. I don’t have much time to think.” Then after two days rest, on the 29th of May: “Well, the Sports Day. As usual was very nervous. 2nd in half mile to Jock David, in 2.12 and two-fifths secs; 2nd in the mile in 5mins 2 and a half secs. So what, I lost to better men but I’m not so young as I was (i.e. not quite 31). Very, very tired. Bed is the best place and the best friend.” Thereafter he gave up running and took up regular badminton! He also enjoyed reading ‘Cycling’ magazine. That September he was sent to hospital by the R.A.F. unit psychiatrist because of serious stress at work (no mention of malaria, but he may have suffered that as well during this period). Two months later he felt fit, but with weak legs; and by the end of 1944 he was sailing past Gibraltar en route for Britain at long last. He may have competed again in 1945; or he may have waited until 1977 to start running once more! 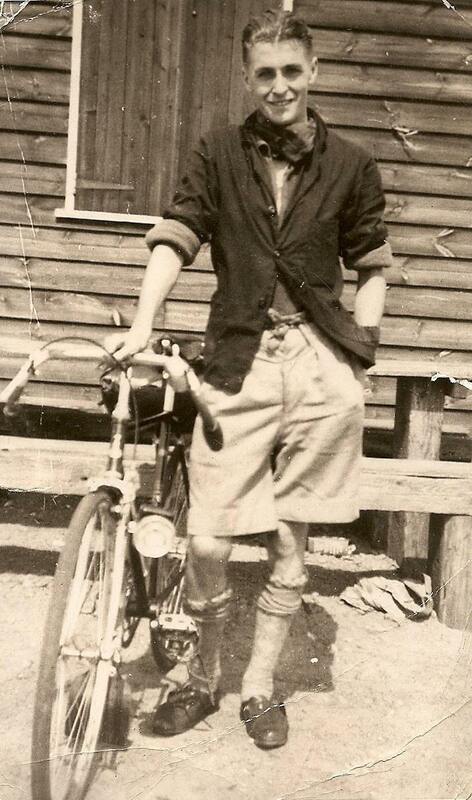 After marrying my mother to be Flora in 1945 (from his diaries it is clear how happy they were with each other) he seems to have restricted his exercise routine to cycling to and from work. However by 1948, apart from hurling me about in the infamous bicycle side-car (sometimes to watch the Sunday morning finish of 25 or 50 mile cycle races, while Mum went to church), he had a number of weekend and holiday bike rides down to Mum’s relatives in Dunblane and district; up Deeside or through Banff and Buchan and over the Highlands. Then in 1949, having built a new bike (a Raleigh Record Ace) he got me a special seat and put in a lot of road miles. On one holiday in July 1949 he went off on his own to Lochinver and on 24th July stayed at Achmelvich Hostel (on the hilly route I did with Innis this summer). Mum did a little bit of cycling too! For 1950 he kept a cycling mileage total: 2790 and a half! The most serious holiday trip in July took him to Fraserburgh; then Inverness, Ullapool, Achmelvich. Lairg, Tongue, Castletown, John o’Groats, Wick, Carbisdale Castle Hostel, Bonar Bridge, Strathpeffer, Inverness, Aviemore, Braemar, and home. Although he did use one local train and one bus, he cycled 441 miles in a week, with two days over 100 miles! Dad’s Youth Hostel card makes fascinating reading. Between 1951 and 1954, as well as ‘local’ stays at Feughside, Ballater and Braemar, he stayed at places as various as Crianlarich, Penrith, Truro, Land’s End, and Dublin. One of Dad’s two major foreign trips was either in 1952 or 1956 (unfortunately I do not have those diaries) when he spent a hectic fortnight probably touring Germany and what used to be called the Benelux countries – I have his battered map but no indication about the route, which would have been supplied by the Cyclist’s Touring Club (CTC). Certainly in July 1954, when he was newly 41 years old, his hostel card and map both indicate a vast tour of Scandinavia. He must have gone south by train before taking a boat from Newcastle to Esbjerg in Denmark. Then he cycled east to Kolding, Odense and Copenhagen before boarding the little ferry from Helsinborg (Elsinore) across to Sweden. He stayed at Orkellunga Youth Hostel and then turned north to Jonkoping and Karlskoga (quite close to Orebro, where Stella and I worked in 1973). After that, it was west to Karlstadt, into Norway and probably on to Oslo. Then he stayed in Eidfjord and Bergen, where he boarded the boat back to Newcastle. I can only speculate on the enormous number of kilometres covered! As late as 1959, as well as leaving me puffing behind on Mum’s lady’s black bike en route to Feughside (19 miles) or Auchmithie (Arbroath – 53 miles! ), he was off touring Wales. Later destinations included Broadmeadows in the Borders, Winchester, Cumbria and Once Brewed (a hamlet on Hadrian’s Wall).